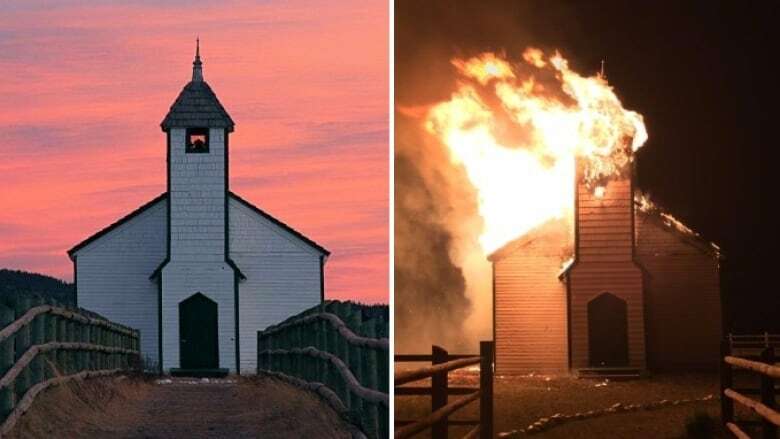 The first permanent Protestant church ever built in southern Alberta was destroyed by fire early on Monday morning, just east of Morley on Highway 1A. The wooden McDougall Stoney Mission Church was built in 1875 to "minister" to the Stoney First Nation by George and John McDougall. "Last night at eight o'clock, our security guy was doing his regular drive by and he was on the site looking around and everything looked fine," said Sarah Harvey, a volunteer and board member with the McDougall Stoney Mission Society, as she surveyed the damage. "Then, a couple of people that are here right now, said about three or four in the morning they heard the emergency vehicles and the place was in flames." Cochrane RCMP said they attended the scene around 4 a.m. They were joined by fire crews from the MD of Bighorn. "Upon arrival emergency services found the McDougall Church completely engulfed in flames," RCMP said in a news release. "Sadly the historic church could not be saved." Harvey said there had been break-ins and attempted arsons at the historic site before Monday's fire — the cause of which is unknown. "Unfortunately, this time no one got here quick enough to save the building," she said. "I can't even believe it. There's nothing left. It's just a burnt-out shell. I'm shocked, actually, the fire did that much damage; it melted our wood stove." A fire investigator has examined the scene and an investigation into the cause of the fire continues, according to the RCMP. The church, which functions more as a historic site than a place of worship, offers weddings throughout the year, one of which was scheduled for this upcoming weekend. It also housed historical artifacts, including pianos dating from 1875. "We had a lot of artifacts and photos and things in the church that are really sad to lose as well, like our pianos," said Harvey. "Our pianos are in storage all winter and I literally just had them delivered back out to the church." Harvey isn't sure if the church can be rebuilt, as volunteers, supporters and descendants of the McDougalls come to terms with the burnt-out structure. "It's still smoldering; you can hear it crackling," said Harvey. "It's just horrifying. It's just hard."